Award-winning author and journalist David Giffels explores the meaning of identity and place, hamburgers, hard work, and basketball in this collection of wry, irreverent essays reflecting on the many aspects of Midwestern culture and life from an insider’s perspective. 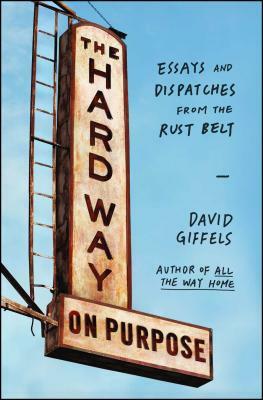 In The Hard Way on Purpose, David Giffels takes us on an insider’s journey through the wreckage and resurgence of America’s Rust Belt. A native who never knew the good times, yet never abandoned his hometown of Akron, Giffels plumbs the touchstones and idiosyncrasies of a region where industry has fallen, bowling is a legitimate profession, bizarre weather is the norm, rock ’n’ roll is desperate, thrift store culture thrives, and sports is heartbreak. Intelligent, humorous, and warm, Giffels’s linked essays are about coming of age in the Midwest and about the stubborn, optimistic, and resourceful people who prevail there. "This collection of essays about life in Akron, Ohio, is so deep and inviting and surprising that I plan to carry a bunch in my trunk. Then, instead of mounting the Heartland defense, I’ll just throw the bigmouth fucknut in question a copy of Giffels’ masterwork and let it do the talking." "[An] appealing, original fusion of personal essay collection and Rust Beltpost-mortem. . . funny and crisplyrendered." "[Giffels] gives you the Midwestern experience, from hoping your greatest sports star will choose his hometown over the bright lights, big city (in this case, LeBron James, who famously didn’t keep playing for his hometown) to the search for the perfect bowling shirt." "Let this heartfelt collection of essays by David Giffels reveal the wit and pride that are beyond all our preconceptions of Akron, Ohio."